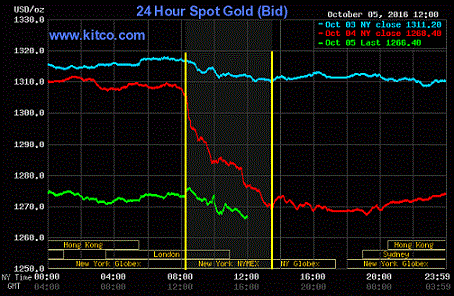 Gold, silver and precious metal miners had a sharp drop on October 4th. Explanations from pundits for the reason for the drop are not convincing. There’s reason to believe that the banking crisis in Europe was behind it, and more selling might be on the way. Gold and silver had big drops on October 4th, leaving the precious metal gurus and commentators scratching their heads trying to figure out why this happened. The losses were sudden and severe, taking place in the five-hour window when gold was trading on NYMEX in New York (see the red line between the yellow bars in the chart below). For the day, gold was down $43 or 3.5% and silver was down 93 cents or 5.2%. The gold and silver miners were really whacked with the ETF GDX down 9.9% and the junior mining ETF GDXJ down 10.9%. Interestingly, even though platinum (NYSEARCA:PPLT) and palladium (NYSEARCA:PALL) are also precious metals, they were both down a more modest 1.9%. 1. Richmond Fed President Lacker, who is not a voting member of the FOMC, saying there was a strong case to raise interest rates (he said the same thing on September 2nd and something similar on April 12th). 2. Better than expected manufacturing data. 3. A decline in the British Pound. The dollar explanation doesn’t hold water for several reasons. First of all, the dollar didn’t have that much of a rally. Secondly, the dollar itself sold off sharply in New York between eleven o’clock and twelve noon. Finally, oil, which is dollar sensitive as is gold, actually rallied while gold was selling off. In the first chart below, the black line is oil, the blue line the U.S. dollar, and the gold line is gold. The red circle shows the gold sell-off early on October 4th. While the fundamental explanations offered by commentators made little sense, others turned to technical explanations. These can explain why gold, silver or gold miners fell to certain levels (at or around the 200-day moving average for instance), but not the cause of the suddenness of the sell-off. To find an explanation for that, we need to look back to the fall of 2008 during the darkest days of the Credit Crisis. At that time, commodity gold dropped around 30% from its high and this puzzled market observers as well since gold is traditionally a safe haven and there was a full-blown global financial meltdown going on. As I explained in a number of my books, it was the meltdown itself that paradoxically caused the sell-off in gold. The big banks were desperate for cash, but couldn’t sell their troubled paper other than for big losses, if at all. They leased gold at very cheap rates from the central banks and then sold this borrowed gold on the market. This consequently pushed the price of gold down. They then bought back the gold at a lower price and pocketed the difference. Essentially, it was free money for the big banks provided by the central bank through a back door. This would work just as well today and the lower the price gold goes (silver goes down with it and so do the miners because they trade together) the more money the banks would make by leasing and selling borrowed gold. There is, of course, a simmering banking crisis in Europe and the UK as I discussed in articles here on 04/06/16, here on 06/18/16, here on 07/07/16 and here on 08/23/16. At the epicenter of the crisis is Deutsche Bank (NYSE:DB), which is trading below its Credit Crisis low. The bank is facing massive regulatory fines and has 7,000 legal complaints filed against it. It is also sitting on a mountain of derivatives and has a only a thin capital cushion to protect it from a crisis. Articles on Deutsche Bank appeared here on 09/27/16 and here on 09/30/16. Interestingly, after the gold sell-off this October 4th, Deutsche Bank AG Chief Global Strategist Binky Chadha (yes, that’s his real name) appeared on Bloomberg TV and stated that gold was 20% to 25% overvalued. Any bank that leased gold, then sold it and now has to buy it back would strongly benefit if this happened. Is it possible that Deutsche Bank would engage in such blatant market manipulation? Regulatory authorities certainly thought so when the fined the bank over $3 billion in 2013 and 2015 for its role in manipulating the LIBOR market (only two of many, many fines that the bank has paid in recent years). However, Deutsche Bank has not been charged with manipulating the gold market. It is also not the only troubled bank in Europe. Until the banking issues are resolved in the EU and UK through nationalizations, bailouts or bail-ins, holders of gold, silver and mining stocks or ETFs/ETNs need to be wary of future sell-offs. Gold ETFs/ETNs include:GLD, IAU, DGL, OUNZ, GLDI, DGP, SGOL, UBG and UGLD. Silver ETFs/ETNs include: SLV, USLV, AGQ, SIVR, DBS, SLVO and USV. Precious metal mining ETFs include: GDX, NUGT, GDXJ, JNUG, PSAU, GDXX, GDJJ, SILJ, SIL, andSLVP. While a banking crisis can create sharp drops (and some protection of precious metal positions can be warranted through the purchase of puts), these inevitably are followed by sharp rises because the gold that has been sold short has to be bought back. 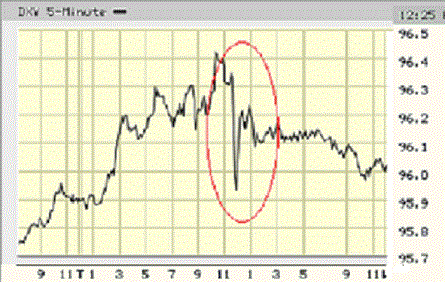 Adding to positions can be very profitable after a period of this type of selling, as it was in November 2008.